Graham Greene once said that life was lived in the first twenty years and the remainder was just reflection. When I read that thought, I wondered if my mother had proceeded beyond the present tense and into the past perfect. The future tense was illusory to my mother because there were so many challenges in the present. Two years after her passing , I remember my mom with ambitions she achieved alongside goals she abandoned. Her ladder of life was flat on the ground around the big house she helped fill from top to bottom. Her friends would tell her that the status she achieved in life wasn't measured by money or vanities but in the accomplishments of her family members. So as I hold a Mass Card that bears the dates of my mother's passing, I think of the longevity she still commands in the advice she gave to her sons and to her grandchildren. In the future, decades from her leaving this world, my mom and the past legacy of her hard work, sacrifice and patience will resonate in the future memory of her extended family. We made a five minute clip about Evelyn Goldbach by compiling images after her death. You can download the clip from OneDrive. 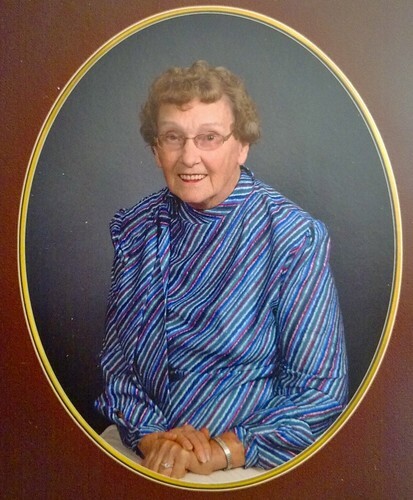 "Remembering Evelyn Goldbach" on InsideView.ie, January 13, 2015.